The high-speed ferry known as The Cat sits at the Ocean Gateway Terminal in Portland on June 6. 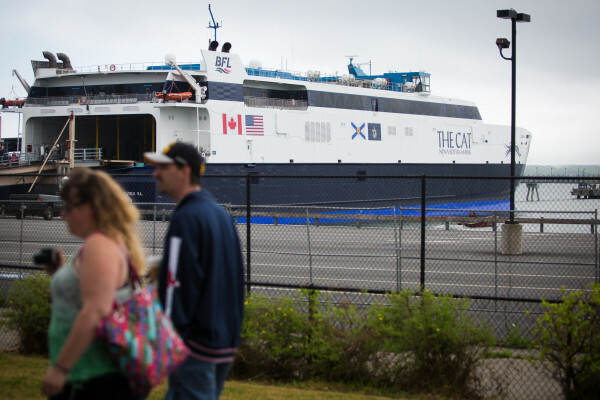 The new CAT ferry between Maine and Nova Scotia has generated cash flow for Portland this season, but the line appears at risk of falling short of a ridership goal set by the Canadian provincial government, which has heavily subsidized the ferry. Since the previously troubled ferry service re-launched under the operation of Bay Ferries Limited in June, Portland has reaped more than $100,000 from the company for the use of the city’s port. The money comes from a fee charged for each passenger and vehicle entering or leaving Portland on the ferry. The city receives a further economic boost from the tourists the line brings to town. From June 15 through August, the ferry carried 32,831 passengers and 9,796 cars on the passage between Maine’s largest city and Yarmouth, Nova Scotia. The ferry carried more passengers in August than in either of the two preceding months. That’s gravy for Portland, but it may not be enough to satisfy the Canadian provincial government, which is giving the ferry company incremental subsidies that will total the equivalent of nearly $20 million. Note: Cars and passengers include arrivals and departures to and from Portland. The ferry only ran for the last two weeks of June. The ferry company’s contract with the Nova Scotia government is based on a business plan for carrying 60,000 passengers over the season that is set to end Oct. 1, Canadian media have reported. It is unclear how missing this goal might affect the service between Maine and Nova Scotia, but the subsidies have become a hotly contested political issue in the province. The goal of 60,000 passengers over a season is close to the number the previous Nova Star ferry carried in its last two years of operation. The old ferry — which was larger, slower and had a longer season than the CAT — carried 59,018 passengers in 2014 and 51,038 passengers in 2015. After missing its passenger goal of 100,000 per year, a federal court ordered the Nova Star ship seized for failure to pay debts. The company filed for bankruptcy protection in 2015, and Portland recently lost a court case seeking $163,000 that the city claimed it was owed by the ferry operator. The money was for upgraded facilities in the city’s port that are being used by the Bay Ferries ship. The company did not immediately respond to a request for comment Friday.